President Ronald Reagan is arguably the greatest American president of the 20th century. Now you can honor him with this exclusive deck of cards — and share his legacy with friends and family. 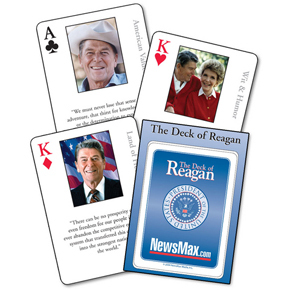 In this special set of playing cards you will discover the essence of Ronald Reagan's wit and wisdom. Each card includes his most cherished and memorable quotes. The Diamonds detail Ronald Reagan's "Land of Freedom" — why Reagan believed America was great because America was free. The Clubs offer Reagan's "American Values" — his ideas on how crucial our core beliefs as a people are to our nation and the world. The Hearts reveal Reagan's "Wit & Humor" — with every card you'll laugh with Reagan at his favorite topics: the Democrats, communism, the big media, and even himself! The Spades capture Reagan's "Problem of Government" — explaining why government is a threat to freedom and how it hurts more than it helps. And the Jokers — you'll really love seeing Jimmy Carter and Walter Mondale, Reagan's two presidential opponents, and their utterly ridiculous comments. On Communism: "How do you tell a Communist? Well, it's someone who reads Marx and Lenin. And how do you tell an anti-Communist? It's someone who understands Marx and Lenin." On the Human Spirit: "We must never lose that sense of adventure, that thirst for knowledge — or the determination to explore the outer limits of our own abilities." On the Ten Commandments: "If a bureaucrat had been writing the Ten Commandments, a simple rock slab would not have been near enough room. Those simple rules would have read: 'Thou Shalt Not, unless you feel strongly to the contrary, or for the following stated exceptions, see paragraph 1-10 subsection #A.'" On Bill Clinton: "This fellow they have nominated claims he's the new Thomas Jefferson. Well, let me tell you something, I knew Thomas Jefferson. He was a good friend of mine, and Governor, you're no Thomas Jefferson." On Big Government: "The best view of big government is in the rearview mirror as we leave it behind." On the American Constitution: "Our constitution is a document that protects the people from government." All of these quotes and many more will provide you, your friends and family hours of smiles and laughter. The big media will never really tell the great and important story of Ronald Reagan: what he believed. You can, by getting The Deck of Reagan and continuing his legacy in this fun way.